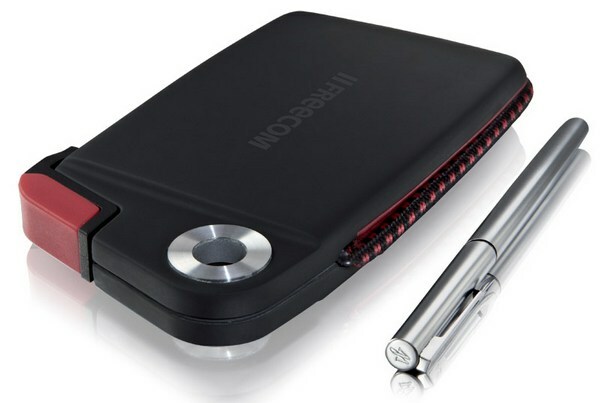 Okay Mr. (or Mrs.) Fumblefingers, you've got your Toughbook for high-impact computing on the go, but when you just need to take that presentation into the office and you don't want to lug your bombproof notebook with you it's time for a rugged external HDD, and Freecom's ToughDrive Sport is the latest. It's a rubberized enclosure sporting drives in 250, 320, and 500GB flavors, protecting them from drops of up to 2 meters while its 256 bit MD5 hardware encryption protects your data from would-be spies -- and from anyone on a Mac, since it's PC-only. The $219 drive (for 500GB) doesn't appear to be waterproof, or even resistant, but hey, check out that USB cable. It looks like a climbing rope! wuih 500 GB???!!! gedhe banget tuh, bisa nyimpen B**** berapa film tuh??? trims yah dah maw knjungi blog saya.